From clay quarries to robotic factories, build your industrial empire through the five technological eras. Experience the discovery and use of steam, the first machines and electricity. Build factories, obtain land and sea route rights for your company. Good control and smart planning will make you the biggest tycoon in the industry! 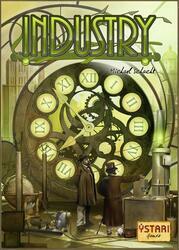 Industry is the revival of the Industria game reviewed and corrected by its author. Sell factories and technologies at the best price, which will bring you money but will also allow you to keep the most lucrative land for yourself. Plan carefully for the development of your industrial empire by betting your money on the most appropriate one. At the end of the game, the player with the most prestige points, from his factories, technologies and connections, wins the game.